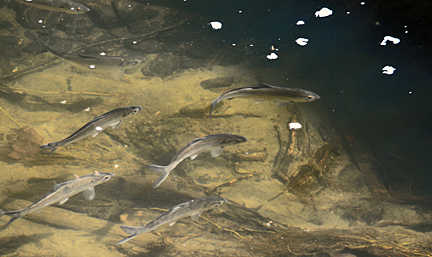 Sure, it’s trout season, but the arrival of herring in local streams is a much more dramatic indicator of the arrival of Spring. These spunky little fish push their way upstream from the ocean into little streams to spawn... by the millions. If ever there was a demonstration of the “lusty month of May,” it’s the sight of a tiny brook, filled bank to bank with silvery bolts of pure energy. This month’s quotes (from On the Table’s culinary quote collection) are still pretty fishy. PS: If you encounter broken links, changed URLs—or know of wonderful sites we’ve missed—please drop us a line. It helps to keep this resource as useful as possible for all of us. To those who have pointed out juicy sites (like Cynthia Bertelsen), thanks, and keep them coming! The Resource Guide for Food Writers, Update #199 is protected by copyright, and is provided at no cost, for your personal use only. It may not be copied or retransmitted unless this notice remains affixed. Any other form of republication—unless with the author‘s prior written permission—is strictly prohibited.